Did T.M. Landry College Prep School cut corners and doctor college applications? BREAUX BRIDGE, La. (KLFY)- The founders of T.M. 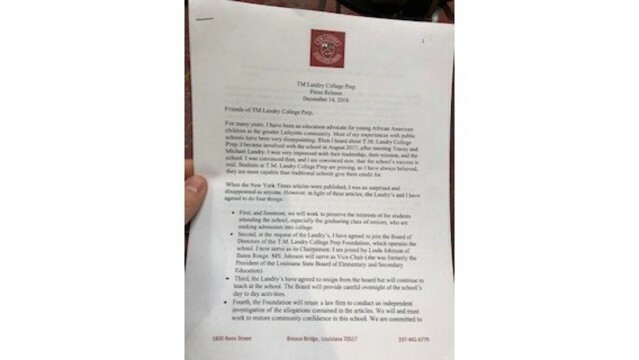 Landry College Preparatory, Michael and Tracy Landry have agreed to step down from the board. According to Greg Davis, Chairman of the Board of T.M. 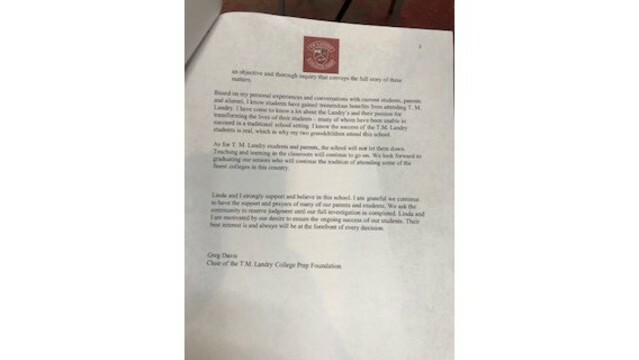 Landry, The Landrys will remain on staff as teachers at the school. The announcement comes days after State Police announced that it was leading the investigation into allegations of fraud and abuse. The school came under fire about the New York Times published its investigative piece on Nov. 30, 2018. The investigation included former students and parents of the Breaux Bridge-based school who claimed its administrators used abuse and fraud to launch students into distinguished universities. Students and parents claim the school manufactured fraudulent applicants. The school's founder was convicted of simple battery in 2012. On Dec. 11, State Police said they were talking the reigns of a criminal investigation into the school at request of Breaux Bridge Police Department.